As you know, I'm so fortunate to be designing for Zva Creations. 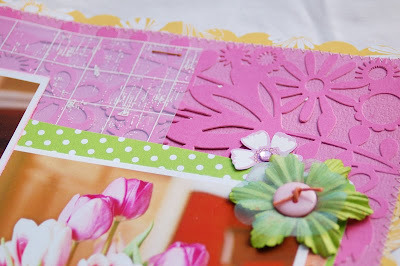 I just love the designs and fun products that Carolyn has. Well, last week she was blessed with the birth of her beautiful new baby girl. She sent me a photo and I HAD to scrap it! Being that I never get to scrap baby pics anymore OR girl photos, it was a real treat. I used lots of Zva swirls and crystals on here. 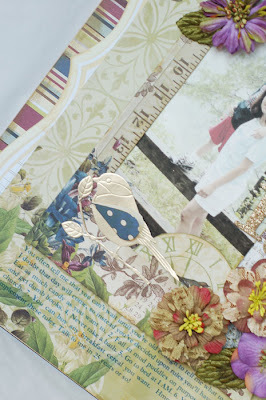 I also used Making Memories, Basic Grey, Melissa Frances and K and Company papers. Those pretty flower stickers are K and Co. I LOVE the colors! So, huge CONGRATS to Carolyn and her family on their beautiful new addition. 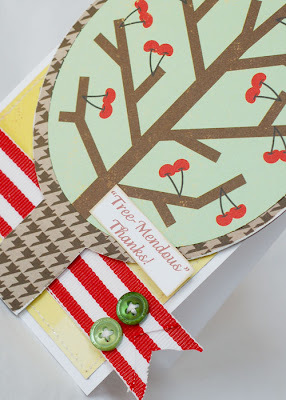 If you haven't yet done so, check out this POST for some World Cardmaking Day fun! 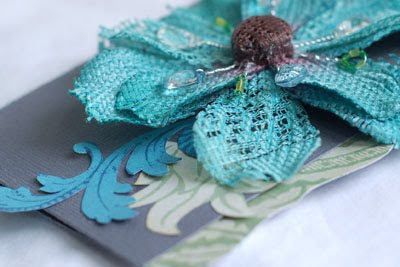 And don't forget the code for your discount at the CK/Papercrafts store. It's right over there -------------> on the top of my side bar. 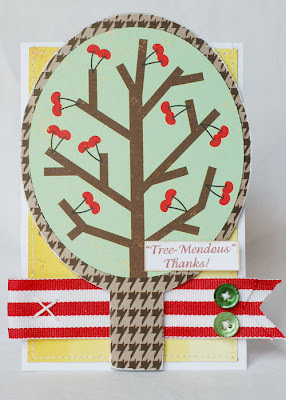 This first card is based on a sketch I did for Emma's this week. 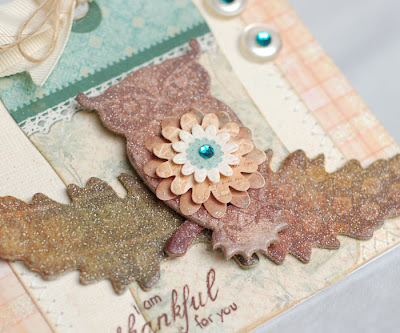 I used some Jenni Bowlin, Tattered Angels and a Hampton Arts stamp. 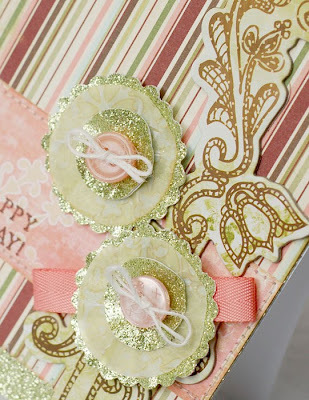 I made the little rosette using some Melissa Frances crepe paper. 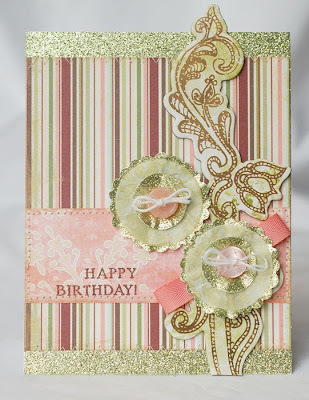 I used some Tattered Angels Glimmer chips, glitter and Glimmer Mist on this next card. I added the glitter, then spritzed it with English Ivy, Candlelight, Indian Corn and JackOLantern to give it a mottled look. That's it for today. I got a couple of boxes in the mail today and I can't wait to go and play. Oh, and I've been holding in a little secret for a while now. Pretty soon I get to spill the beans and let me tell you I can't WAIT!!!! 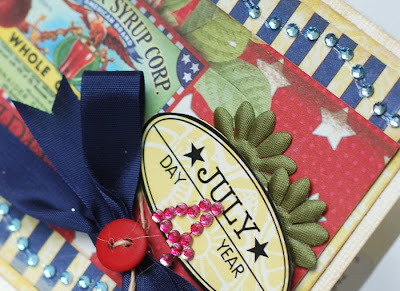 As you may know, a week from today is World Card Making Day sponsored by Paper Crafts magazine. I explained a few things in THIS post. Definitely check out their website and join in the fun. One of the things I was asked to do was to create a card just for this celebreation. Well, I did that this morning. I wanted to use these sweet K and Co. butterflies, so I came up with this. The paper is K and Company, too. 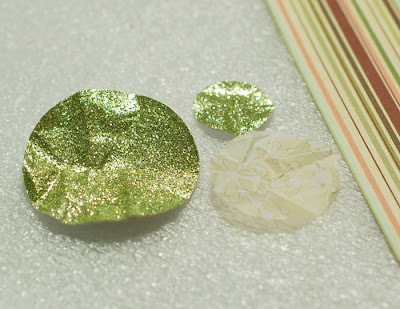 I created the circles by punching circles from plastic packaging, squirting them with Glimmer Mist and adding clear glue and glitter. It creates a fun watercolor effect. Hope you're having a great weekend. 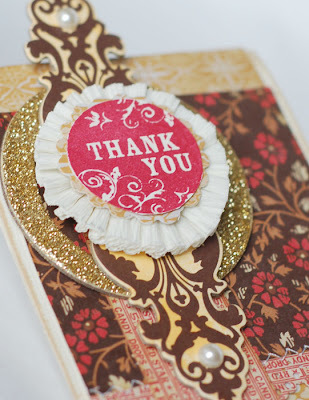 Thanks for stopping by and be sure to check out the other bloggers on the Blog Hop. Additionally, if you plan on doing something on YOUR blog for WCMD, you can link it up at the PC site! OK. Seriously. 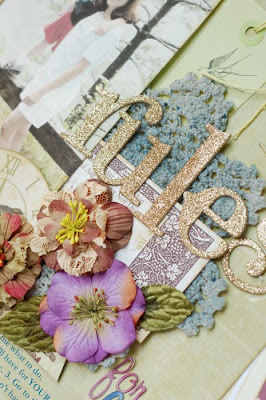 I could create with Webster's Pages everyday! I love the lines sooo much. 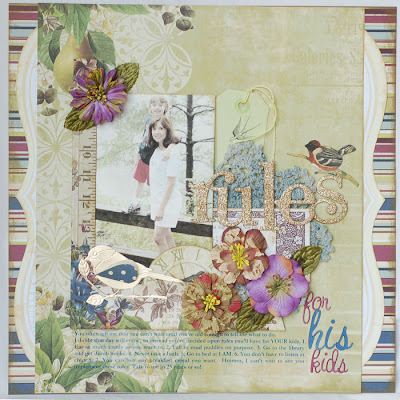 They are so soft and pretty, yet, I can make them work with my boy pages. And the colors.... Nature's Storybook may be my favorite line, yet! 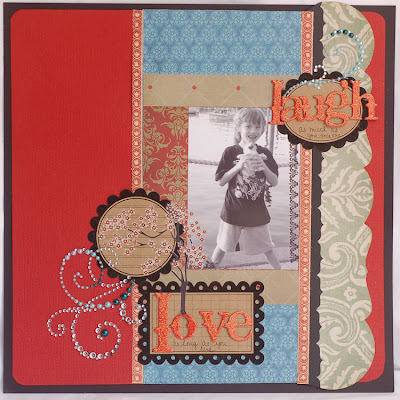 I used some vellum and calendar cards on this one along with some Creative Imaginations papers. 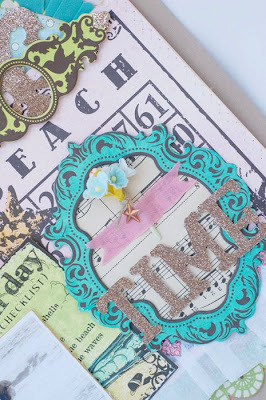 I added lots of chipboard that I glittered. Thanks for stopping by. 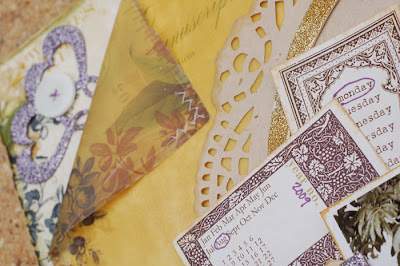 And if you haven't yet seen my post about World Cardmaking Day and the awesome discount that you can receive for the CK/PaperCrafts store, and the un blog hop that is going on, just scroll down to the next post! 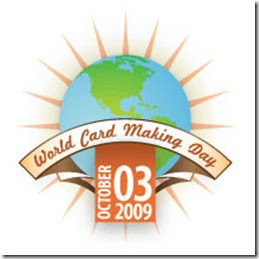 Did you know that World Cardmaking Day will be here soon? Yes, October 3 will be here before we know it and the gang at Paper Crafts Magazine have some fun activities planned to celebrate it. 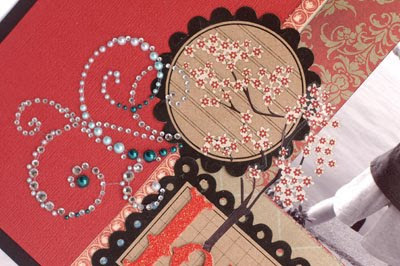 First off, you can use the coupon code posted on the top of my side bar to get 25% off anything in the CK/Paper Crafts online store. The coupon is good until midnight on October 12. 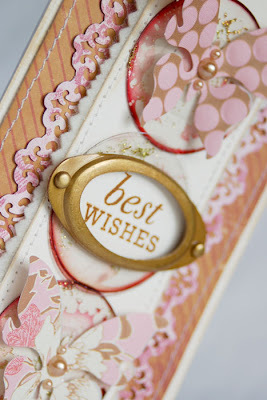 Next, check out the World Cardmaking Day official website. There's lots of inspiration there and you can find information on events to celebrate this event! 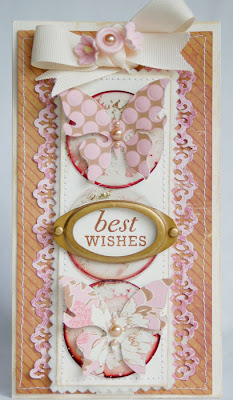 If you go HERE, you'll find the blogs of 24 other talented cardmakers. 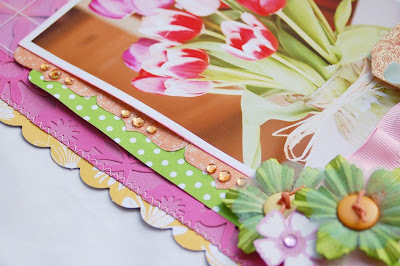 All this week, we will be posting new, never before seen cards, so there will be tons of eye candy to get you into the mood for World Cardmaking Day. My card will be up later this week! As you can see, there's lots of fun stuff going on! Speaking of cards, I leave you with this one for tonight. 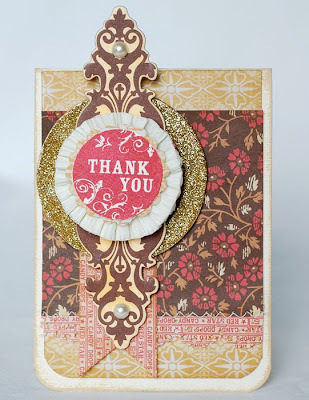 Have I told you how much I LOVE Prima products? Well, this big bejeweled flower is one reason why! Isn't it gorgeous. I just had to make a card using it as a focus. 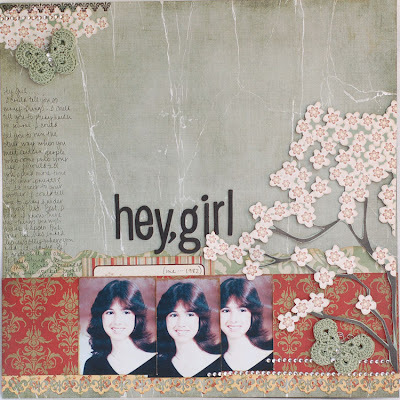 I handcut some elements from Graphic 45 and Pink Paislee papers and placed them on grey cardstock. It was so quick and easy to make! So, definitely check out the links above! Happy Sunday! 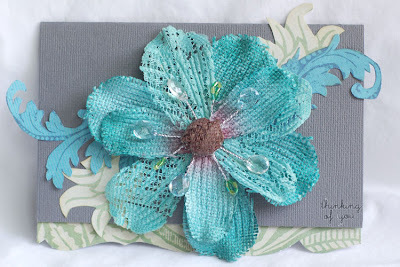 Today I have a special page to share with you. I absolutely adore tulips. So, this layout was so fun for me to create. 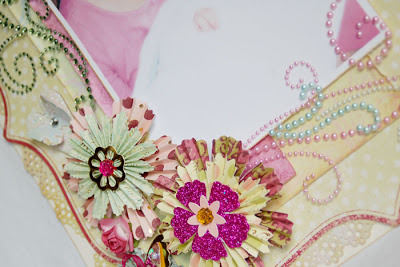 I did lots of layering on here and used lots of my favorite goodies. Recently, this page was selected by CK as one of their Amazing Pages featured online. You can see all ten pages HERE. One of the reasons I love this page so much is because my dear friend, Sherry Wright sent me these tulips! One of the best parts of this hobby, for me, has been the friendships that I've formed. I 'met' Sherry early on and we've been friends ever since. Her work is beyond amazing, but it's her support, generosity and sincerity that I love most about her. I'm so blessed to have her in my life! One of these days, maybe we'll actually meet each other in person. LOL! And guess what? Today is her BIRTHDAY! So, if you have time, stop by for some major eye candy and wish my dear friend a Happy Day!! Her blog is HERE. September 20 is also a special day for another one of my dear friends, Jessica Witty. I've known Jessica for several years and this girl is AWESOME! 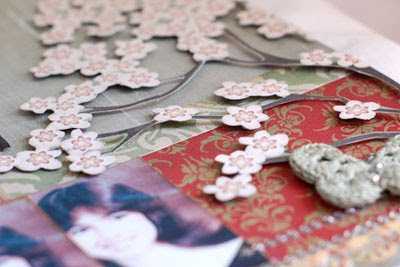 Aside from the fact that she is mega-talented, (Hello, Paper Crafts Go-To-Gal!!! )she is so kindhearted, sweet and HILARIOUS! I had the chance to finally meet her this summer at CHA and we laughed the whole time. I truly value her friendship and am so lucky to have her in my life, too. So, stop by for more eye candy and wish her a Happy Birthday, as well! Her blog is HERE. Hope you both have a wonderful birthday!!! And thanks to everyone for reading my sappy love fest today! How is it that it's Friday already? This week has really flown by! Thankfully, the pace at work has slowed down a bit and I was able to catch my breath. We're definitely into our school routine now. I'm so proud of how well Ryan has handled this whole transition. He's a pro now! I'm so excited that I was able to participate in this week's CPS sketch. Zva is the sponsor. There is a HUGE prize package, so it's not too late to play along and try to win some Zva goodies. I used some new Zva xrystal borders on it. The 4 is from one of the Zva alphabets. I colored it in with a red sharpie. 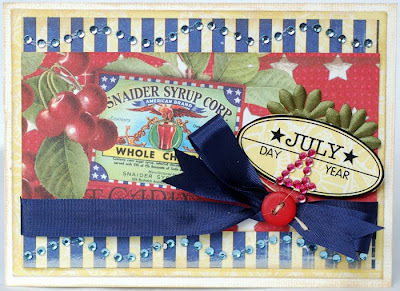 The papers are Websters from the Sweet as Cherry Pie line. 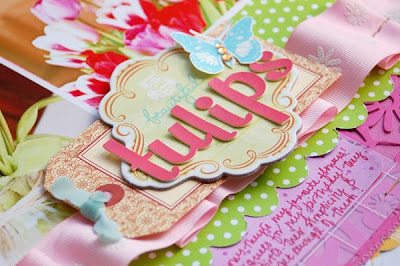 My next projects are from the Septemember Label Tulip kit. Sadly, this is my last month with them. I've had to cut back on some of my committments now that I'm back at work. 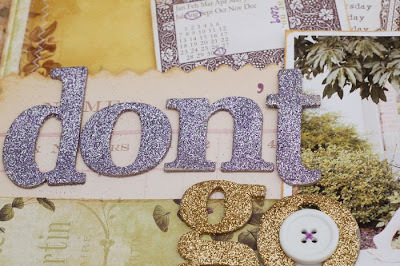 If you're interested in working with a GREAT kit and becoming part of an awesome community, Jennifer is looking for a couple of more designers. You can find out all of the info. here. The deadline is Sept. 21. Anyway, this first page is the one we had as a challenge. We had to scrap a letter to our 18 year old selves. I handcut the tree and added it with foam adhesive. 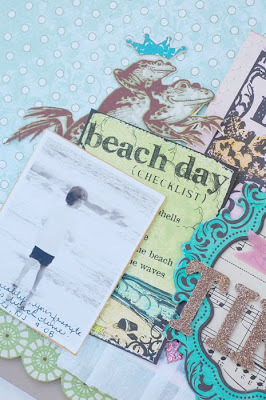 This next page uses some of the fun Maya Road journaling spots in the kit along with some Pink Paislee and Graphic 45 papers. That's it for now! Thanks for stopping by and have a great day! Hi! 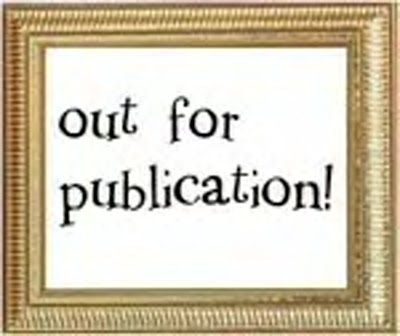 Just a quick post today, as I'm running out the door for another one of my long days at work. We had a great weekend in Cape May, NJ. Our neighbors got married there on Saturday, so we took my mom and made a weekend of it. Cape May is at the bottom tip of New Jersey. It is such a sweet, charming, town. All of the buildings are Victorian style and are painted in beautiful, vibrant colors. And the beaches are beautiful. We stayed at a hotel right on the ocean. Ryan was thrilled to find a new arcade and mini golf place to add to his favorites! We just love it there. 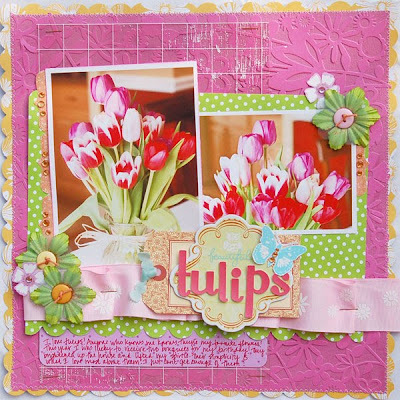 Here are a couple of sneaks for this month's Label Tulip kit. I loved the rich colors this month! The kit reveal is tomorrow and you won't be disappointed! We just got back from a really fun weekend at the shore! After last week's craziness, it was so fun to soak up some rays and meet up with friends and family for some good times. I feel relaxed and ready to face the week. 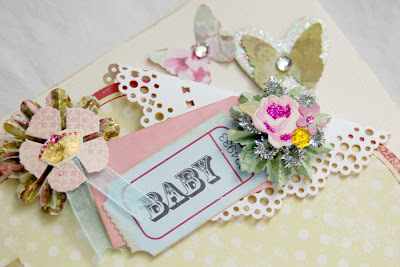 Here are a couple of things I've done recently for Tattered Angels. 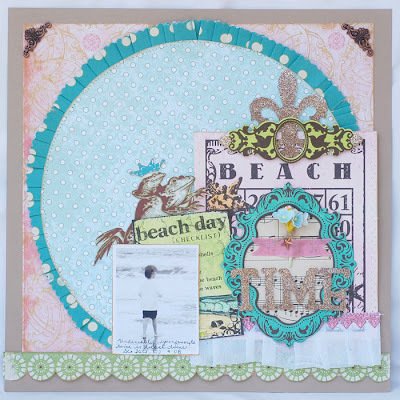 This first layout uses some Websters Pages papers and lots of TA goodies inclusing Glimmer Mist, Glimmer Chips and bingo cards. And this next card is the project of the month at the TA website. I did a little tutorial on how to create shaped cards. You can see it HERE. Finally, I wanted to let you know that Label Tulip is having a DT call. I have LOVED being a Tulip Girl these past 6 months, but I'm going to have to step down. Because I'm back at work, I just had to cut back and unfortunately, this was what I had to let go. I truly encourage you to try out. The kits are amazing and the other TGs are wonderful. You can get more info HERE. So far, so good. We seem to be settling into a routine. Kind of. ;) I'm in hyper -organized mode and everything that needs to be done has been getting done. I can't say I love being a working mom, yet, but it's not too bad. It definitely makes my time home with the little guy that much more precious. In between running myself around this week, I managed to make a couple of cards! this first one is for Dawn's challenge. 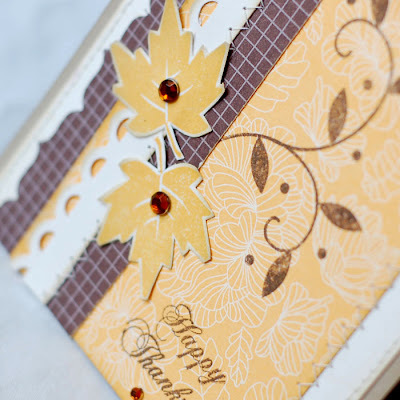 The colors are really 'fallish', so I pulled out my new PTI Fall Elegance set and made this little card. The vine is from Beyond Basic Borders. I added some Zva crystals to it. Love the little touch of bling they bring. I also decided to pull out my Heartprints set again this week. I love this set!!! 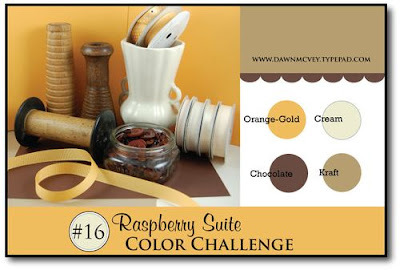 When I went to Dawn's blog to pull up the color challenge photo, I noticed she used the same set on a card. And they are quite similar! Great minds must think a like. Here's a fun little Valentine. The circle of gems is Zva, too! 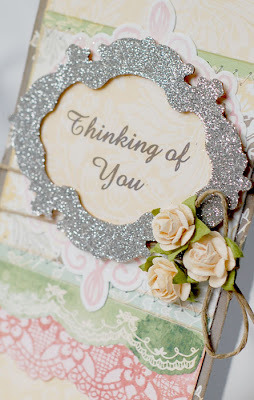 And the die cut paper is from Making Memories.